"Japanese singer, songwriter and multi-instrumentalist Shintaro Sakamoto returns with a new full-length, ‘Let’s Dance Raw’ on Other Music Recording Co. 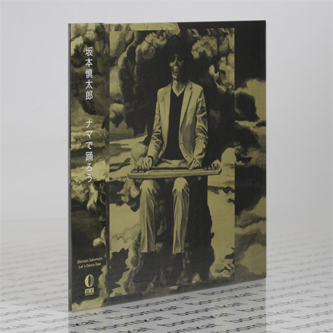 The album is the follow-up to Sakamoto’s solo debut, the otherworldly folk- pop masterpiece ‘How To Live With A Phantom’ (2012). While ‘How To Live With A Phantom’ was the first many around the globe knew of Sakamoto, he has long been an icon in his homeland, having long fronted the psychedelic phenomenon Yura Yura Teikoku, a Tokyo-based band that emerged from Koenji’s legendary UFO Club scene and, across their 20-year trajectory, achieved mainstream success throughout the country. Following the group’s break-up in 2010, Sakamoto began working on ‘How To Live With A Phantom’, a bold stylistic departure that eschewed Yura Yura Teikokou’s psychedelic freak-outs for a much quieter and harder-to-define sound. From first glimpse of the cover of ‘Let’s Dance Raw’, it’s clear that once again, we are entering uncharted territory. 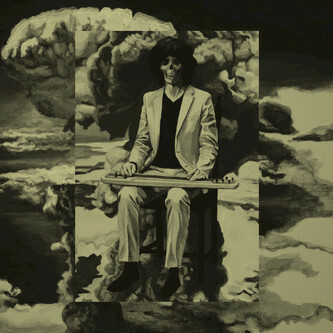 The record’s sleeve, painted by Sakamoto, features the artist sitting upon a black throne, a steel guitar resting on his knee like a child being protected from the ominous mushroom cloud of smoke billowing behind him. A grinning skull has replaced Sakamoto’s face. 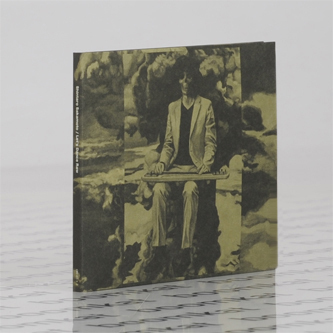 This dichotomy of bright, innocent beauty and subtle perversity is the essence of ‘Let’s Dance Raw’, with Sakamoto moving even further from the tough underground power-trio psychedelic rock of his former band. Sakamoto hinted at the new sound throughout his solo debut and here the music is blown wide open, with the steel guitar as the unifying force throughout. Sakamoto purchased and learned how to play the instrument just prior to writing and recording ‘Let’s Dance Raw’ and it enriches the post-apocalyptic exotica on these ten songs, fusing together the bright and breezy shimmer of Hawaiian slack-key hula melodies, the dusty shuffle of South Western desert blues and the space age bachelor pad music of post war suburban dreamers. The result is an album that revisits the soundtracks of musical escapism made popular in post war American and Japanese cultures and deftly updates them. It’s all anchored by deep, jazzy grooves straight out of a 1970s AM radio broadcast and peppered with flourishes of Brazilian and Latin percussion throughout. Atop the music, Sakamoto sings of the human race’s downfall, the weight of the lyrics made contrastingly perverse via duets with robotic vocoder voices and helium-voiced cartoon chipmunks cooing in an unsettling fashion alongside him. While Sakamoto once again handles the bulk of the instrumental duties, faithful drummer and percussionist Yuta Suganuma also returns for this set, as well as bassist AYA, on loan from fellow Japanese psychedelic explorers OOIOO."